With his deep-seated insecurities and preference for dogs over humans/Whos; we have all been able to relate to the Grinch at some point in our lives. And now you can stay in his city-based lair, which is much better situated than his ominous Mount Crumpet residence. Laterooms.com has launched a competition where you – and your favourite grouchy buddy – can stay at The Strand Palace, a four star hotel in London’s West End on December 20, 2018. The room itself will be decked from floor to ceiling with all things Grinch; complete with green furniture, a sleigh bed and typically rude and cynical messages from the small-hearted loner himself. In a decidedly un-Grinch like gesture, there will be Christmas presents piled around a festive as heck Christmas tree. However, I would make sure to open these gifts quick sharp just in case the Grinch decides to get up to any of his old tricks. There will also be a Grinch themed menu, which one would hope includes the option for a carved roast beast followed by a hearty helping of Who-pudding. Guests will receive tickets for ice skating at London’s iconic Natural History Museum, travelling there like the mayor of Whoville himself, aboard a horse drawn carriage. After skating the night away, Honarary Whos will then head back to the hotel room to cosy up in Grinch pyjamas and enjoy dinner in their one-of-a-kind room. After a night of restful sleep in the Grinch’s sleigh, they will then head out to see the brand new Grinch film starring Benedict Cumberbatch voicing the title role. 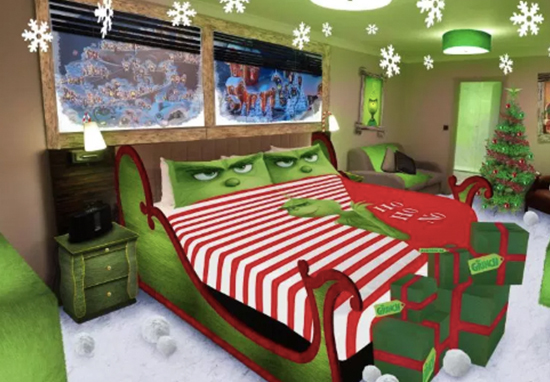 Spend the night in the Grinch’s sleigh – sleeping in a room decorated in true Whoville style. From candy cane lights to snow covered floors and snowflakes falling from the ceiling, this is a room like no other. There will also be lots of extra Grinch-themed surprises for our winners too – including a Whoville decorated Christmas tree with some very special presents from the Grinch himself… who knew he could be so nice! To be in with a chance, all you have to do is visit the Late Rooms website and answer the question ‘What do you love most about Christmas?’. Of course, the Grinch would no doubt struggle with this question, being a well known opponent of the festive season and everything it entails. However, for most non fuzzy green people this shouldn’t prove too tricky. The competition will be open until midnight on December 7 at midnight. You will need to be over the age of 18 to enter, meaning Cindy Lou Who will sadly be banned from applying. Now you just have to find your very own Max to take along with you. The Grinch will be wriggling down cinema chimneys throughout the UK from November 9, 2018.